My brother-in-law Mark is known for his super fishing skills in my family, and over time it’s grown into Superhero status. It started very simply over 10 years ago when he used to be a fishing guide in the Queen Charlottes. 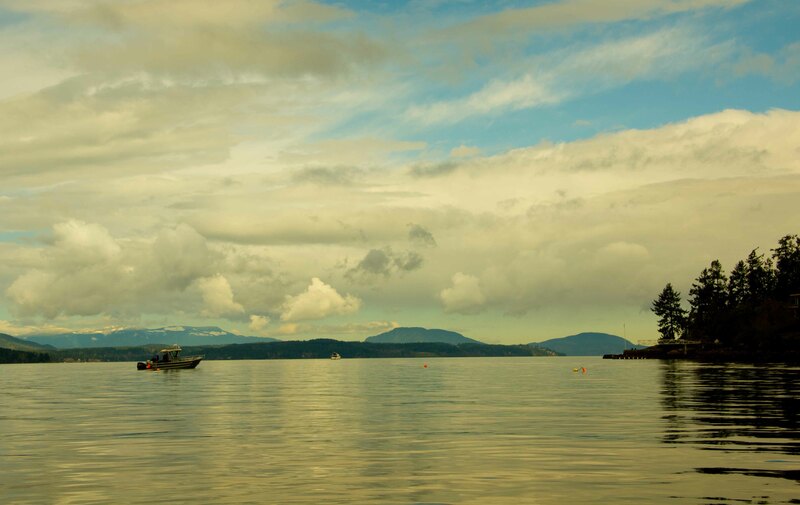 Every few months, there’d be a call to go out to the airport where we’s pick up gigantic pieces of Chinook salmon. My parents were given a few pieces from these hauls and raved over the quality and size of the beautiful “King” salmon. 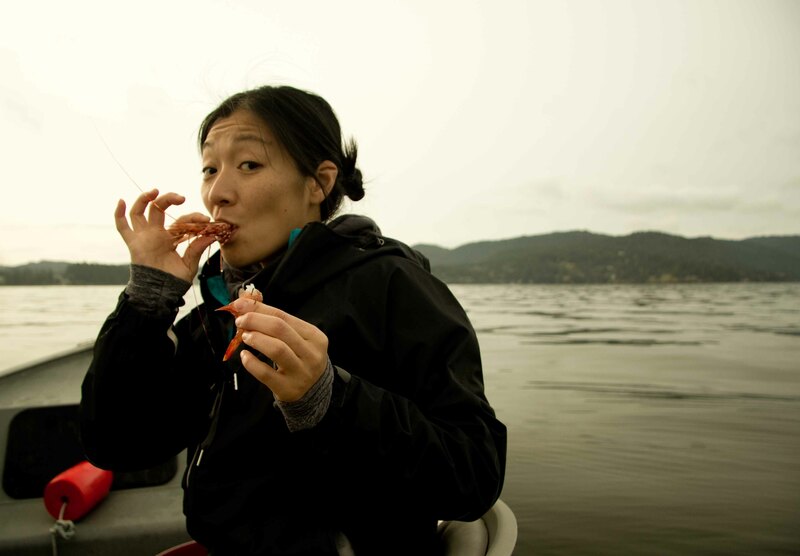 Then he moved to Tofino, where on one weekend, he treated my sister and I to a feast from the sea which included crab, oysters and big slabs of salmon cooked on the bbq. That was followed up with a visit by my brother, who indulged in one of “his best meals ever” on Chesterman beach eating whole Dungeness crabs and just pitching the shells back into the ocean. 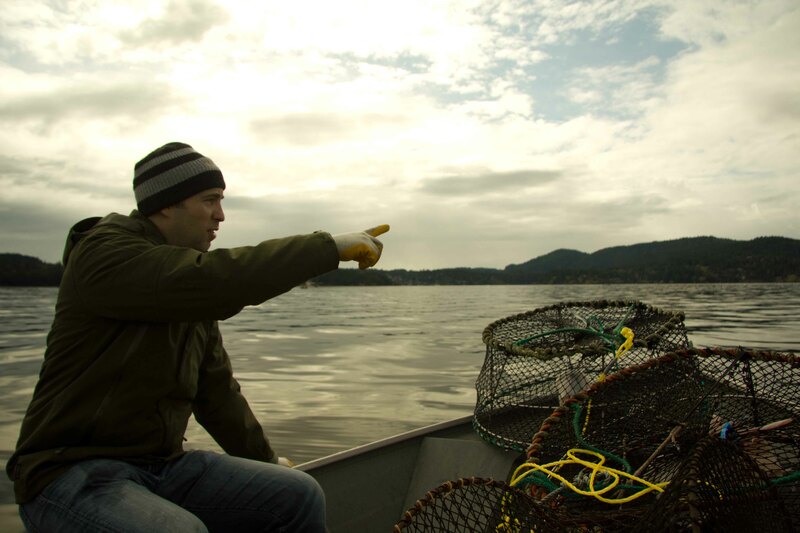 Over the past few years, Mark’s legend has waned a bit… He got a “real job”, moved to Victoria with his wife and kids. But true legends never die and Mark’s magnificent fishing skills surface for us once in a while. 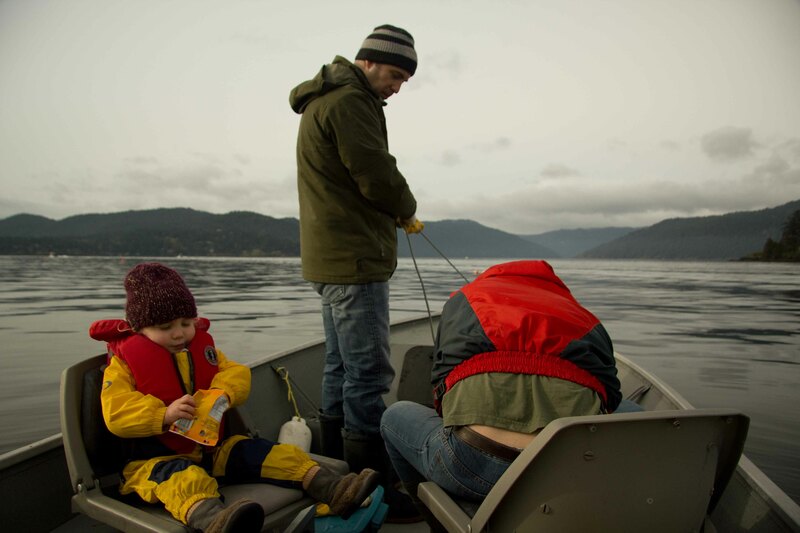 Last summer, we had a successful adventure crabbing and the timing of this Spring’s to Victoria visit just happened to coincide with the opening of prawning season in BC. How very convenient for us! Marks boat was de-winterized and prepped for the first use of the season. 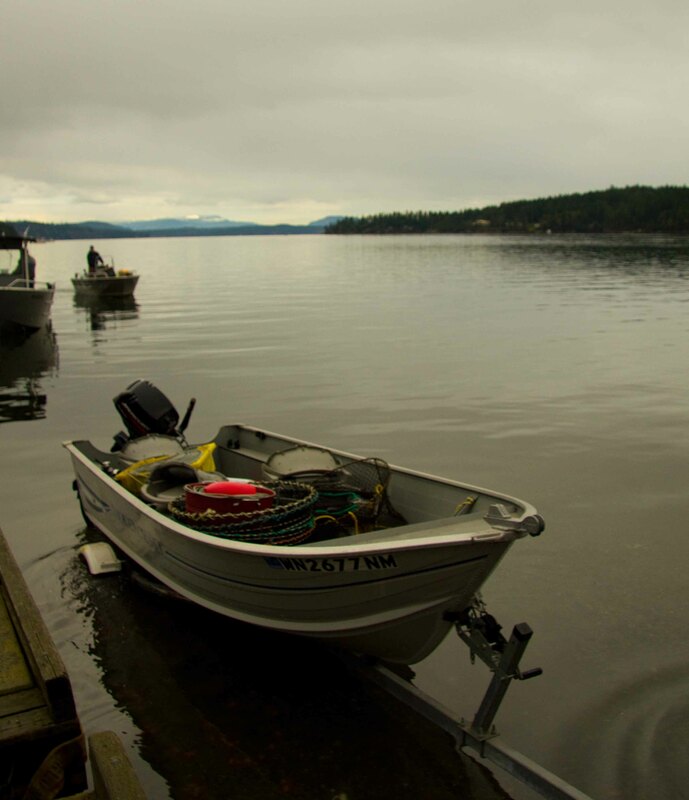 With gear packed, we launched the boat into the frigid waters off Brentwood Bay. 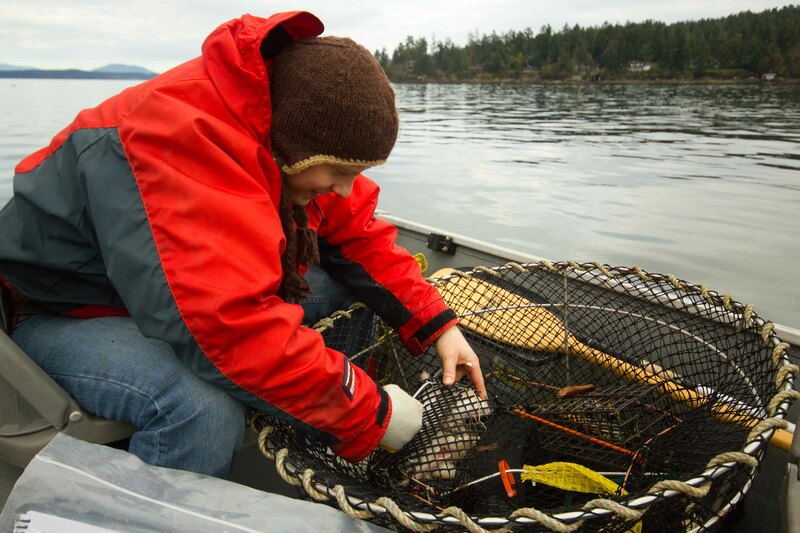 Baiting one of our newly acquired commercial traps with halibut bait. Mark claims its 4:1 more effective over other types of bait. Theres a lot of strategy involved in picking the spot to drop the traps. Go where the others are, in hopes they know something you dont? Or go out on your own in hopes that there will be more for yourself? 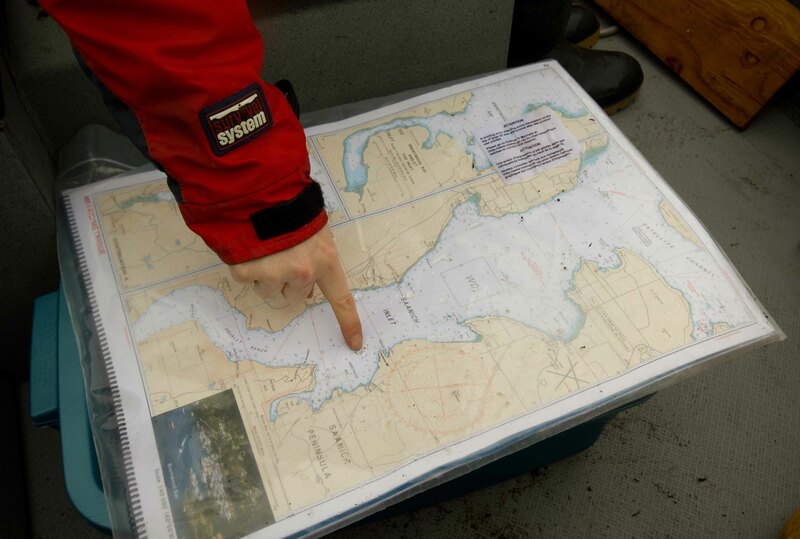 I was using my zoom lens to spy on other boats to check out what kind of catch others were getting. I also took the opportunity to snap some shots the wonderful. At this point the rains really started to come down on us. 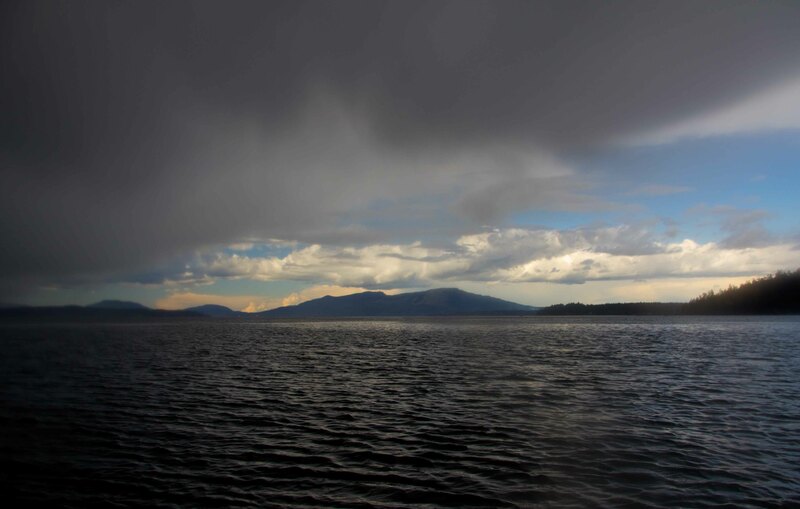 I was happy to have my rain gear on, but I have to admit, fishings not as much fun in the rain. 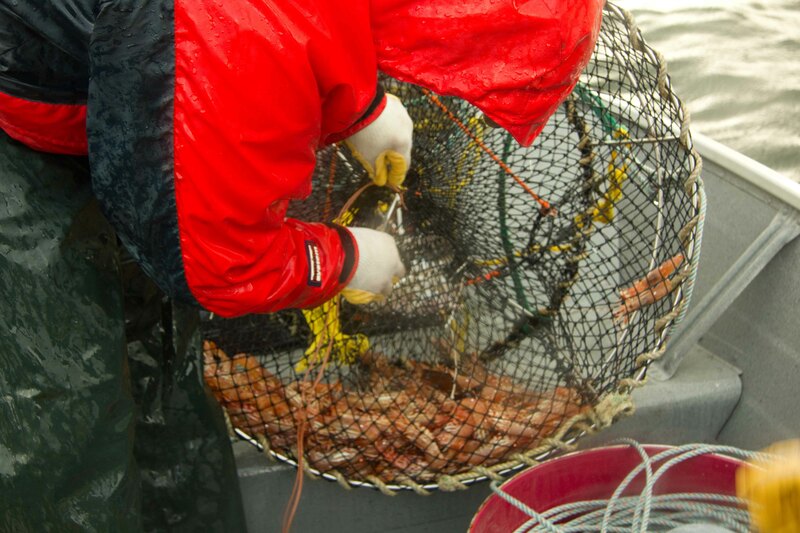 It takes about 10 minutes of hand-pulling to bring up the traps. 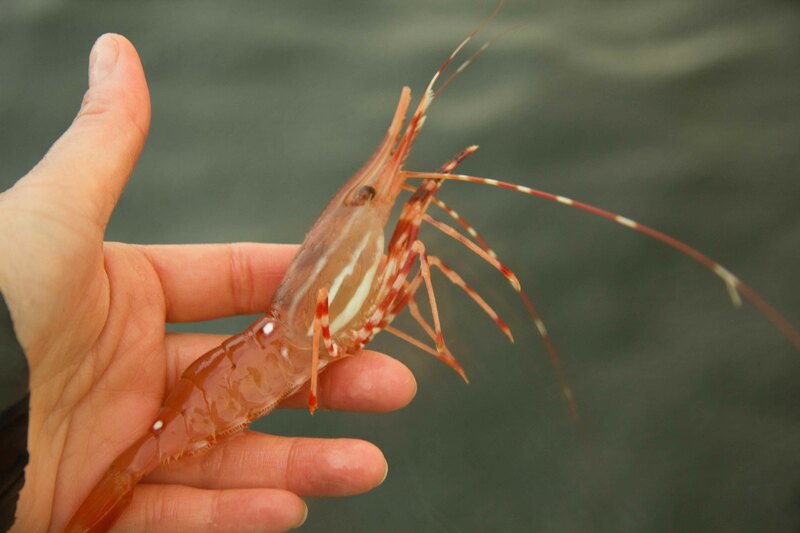 Theres a lot of speculation that goes on during this time about how many prawns may be in each trap. Theres lots of excitement with this abundant pull! 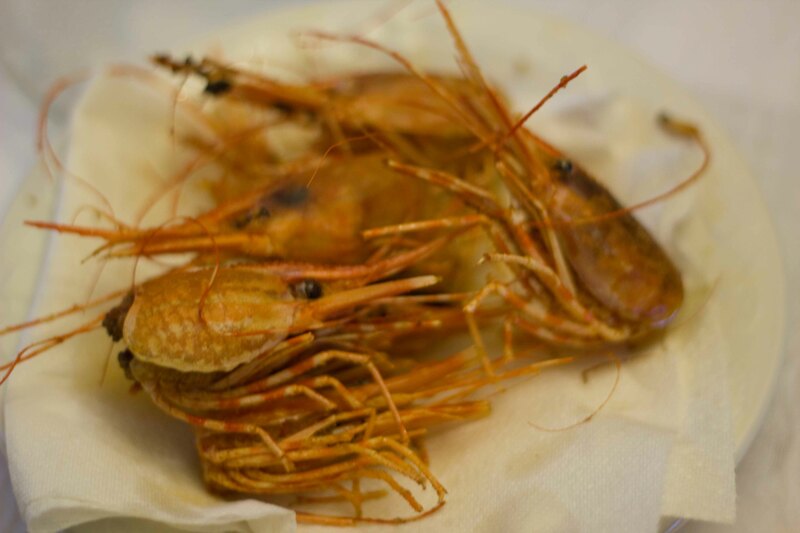 Beautiful spot prawn, just waiting to be devoured. Of course I couldnt resist. The sweetness of the prawn, salty from the ocean and that surprise that comes when jumps back just a bit when bitten can only be defined as a food lovers peak experience! I must have eaten at least 10 straight out of the traps. We werent the only ones enjoying the bounty from the sea. 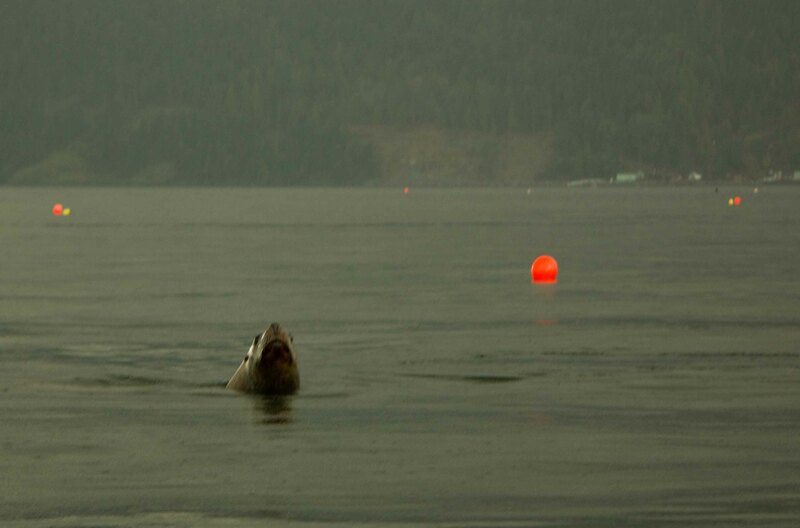 A sea-lion came in close to our boat to see if he could share in our catch. Minus the ones I kept eating… our total was 480! 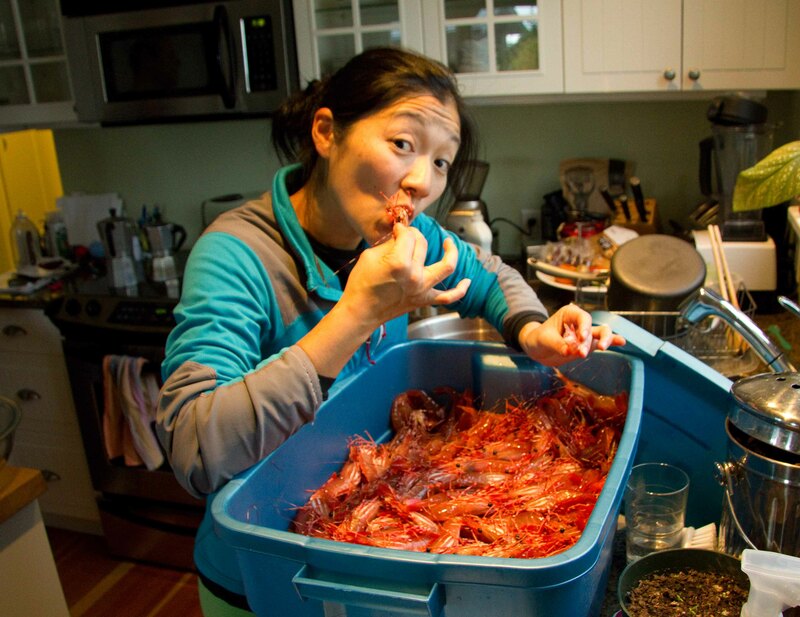 What do you do with so many prawns? Not wanting to mess with our fishing karma, I did not plan a special feast around our catch. So on the first night we sautéed these beauties up in a load of butter, olive oil, shallots, garlic and finished with some parsley, s&p. We went back the next morning to re-check the traps after a night’s soak. 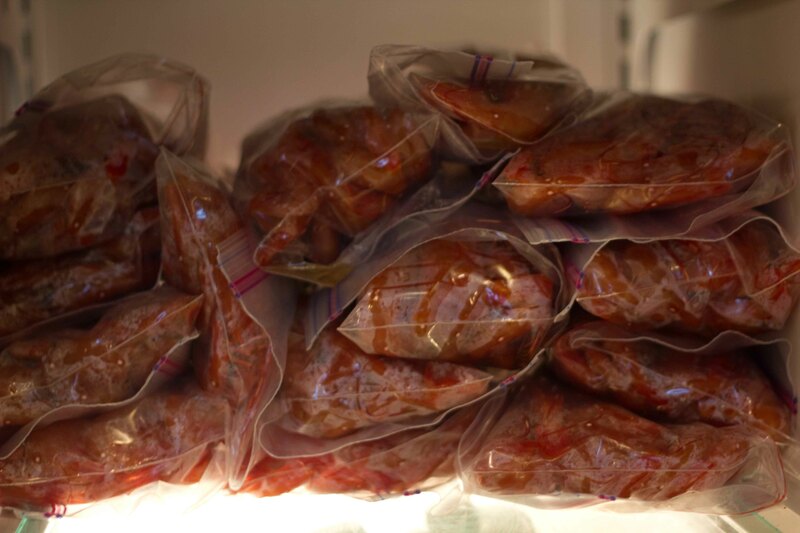 Although not nearly as successful, we were able to get enough for me to bring to my parent’s place for Sunday dinner. Showing up with a bag of fresh prawns, personally caught for them has only made the magic of Mark grow in my parent’s eyes. To them, and me, he is Mark the Magnifico! 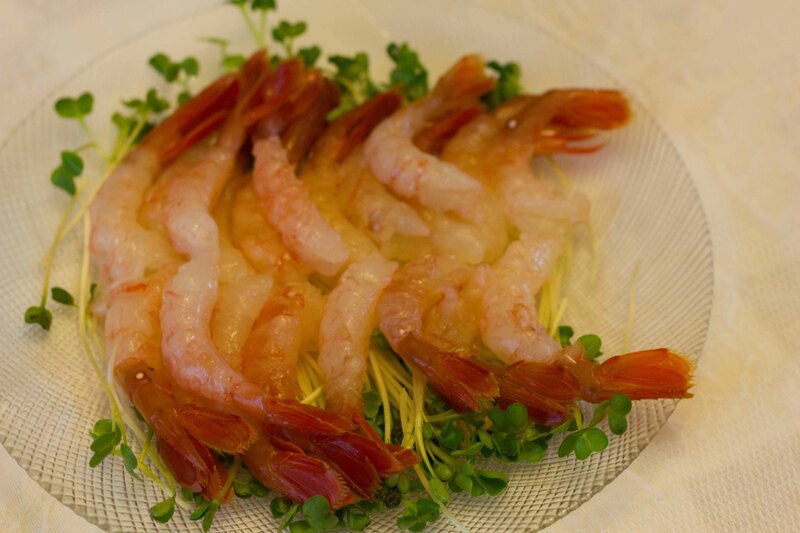 The best way to enjoy this spot prawns, or “amaebi” is raw with a tiny bit of soy sauce and wasabi. The best amaebi are served with their heads fried. My mom fried this for the first time tonight. Lightly tossed with corn starch and thrown into a vat of hot oil, theyre crispy like chips. I want to thank Mark the Magnifico for the adventure. But the biggest kudos go out to his wife Megan for lending him out to us! 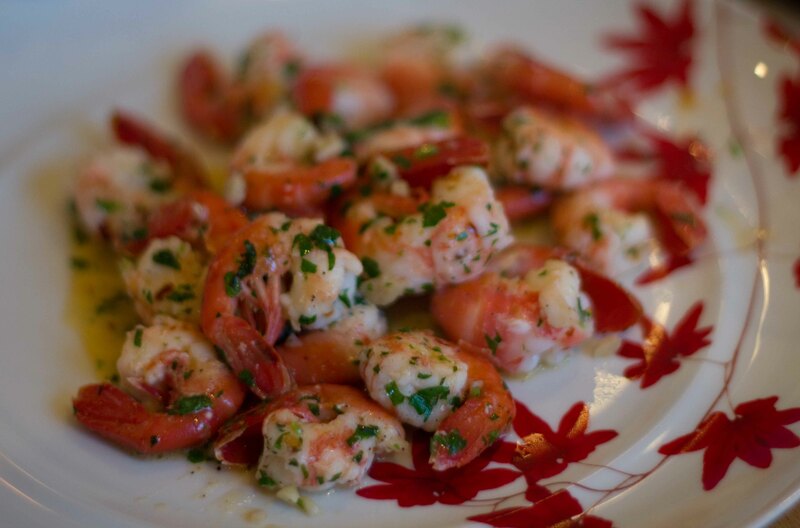 PS: My imagination is running wild just thinking of what I’ll do with these amazing prawns!